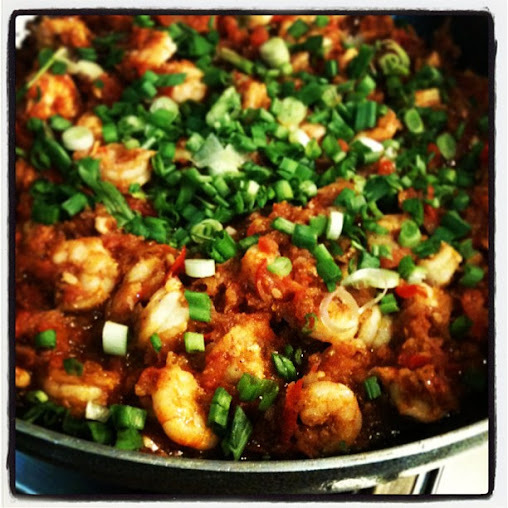 Ahh simple pleasures of life - spicy, sweet and sour prawn curry from Indonesia for a lazy Saturday lunch! This curry is popular throughout Indonesia and is known as Udang asam pedas. I have made it several times, with prawn and with fish fillet, and we get excited eating it every time :) So flavourful and comforting! You can control the spiciness with the amount of chilies you use to suit your taste. Sourness comes from tomatoes and tamarind water, which gives a lovely flavour, but can be substituted with lemon/lime juice, if you cannot get it. The sweetness comes from the onions as we are going to use lots of it! A nice addition to garnish is deep-fried shallots, which I didn't have this time. You can also prepare the prawns and the sauce in advance and keep them separately for serving later - just heat up the sauce and once hot, add the prawns and finish cooking. Serve it with steaming rice, flat breads or noodles and fresh salad. 1. Mix the prawns with salt, turmeric powder and chili powder and let it marinate for 10-15 minutes. Heat the oil and fry the prawns in batches for around 2 minutes on high heat (we will finish cooking them in the sauce). Remove the prawns from the pan and put them on paper towel. 2. To make the sauce, heat the oil in a wok/large pan and fry the onions stirring often for around 10 minutes, till they are soft and just start browning. Add the garlic, ginger and chilies and stir-fry for another minute. Add coriander powder and stir-fry for a minute. 2. Add the tomatoes and tamarind water, mix it well and let it cook for around 5-7 minutes on low heat (or till the tomatoes are soft). Adjust the seasoning. 3. Finally, add the prawns and cook it for another 3-4 minutes, or till the prawns are cooked through. Garnish with spring onions and deep-fried shallots and serve immediately. Ir vienaip, ir kitaip žiūrėjau, pasitryniau dar kartą akis ir net šoktelėjau nuo kėdės! Jūrate, baisiai smagu Tavo virtuvinius eksperimentus ir vėl skaityti!